The Upper Gauley Virgin no more! Today was my first day on the Upper Gauley River. 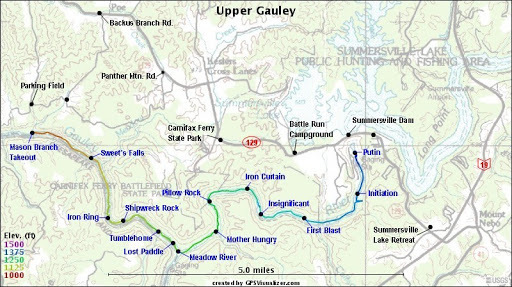 I joked that I was an Upper Gauley virgin. Stephen and I met up with James at the take-out, and set up shuttle. We met Kristin at the put-in (Summersville Dam) and got our gear sorted out before getting on the river. Last year, I paddled a little portion of the Upper at the put-in up to “Initiation” rapid, where I thought it looked too scary, got hung up in a tree branch and convinced Stephen to hike out and call it a day. On Wavesport Open day, I ran shuttle, and hiked a mile up to Sweets Falls and ran the falls to the take-out. I had only been paddling about 4 months and Stephen thought that the river would be too much for me. Today, I wasn’t sure that I was ready yet, as I had no idea what to expect downriver, but Stephen put me in a new Jackson Fun (which is a size too big for me) and was convinced that I would do fine. I was really nervous, and after ferrying at the top of the river and feeling very tippy and out-of-control, I was very nervous, and upset and didn’t want to continue on. Stephen convinced me to run the first rapid, and then I could hike out if I wanted. Well the first rapid went fine, Initiation went fine, Pillow Rock went fine, Iron Ring went fine, Lost Paddle went fine (in fact I had a perfect line through the top part of this rapid), Sweets Falls went fine. I managed to paddle the whole 5 miles without mishap. Just above the take-out, there was a little boof-slot that Stephen went over first, plugged and did a loop. I thought that it would be cool if I tried to do the same thing, and plugged over the lip and flopped over. I then was sucked back into the pourover and proceeded to get worked for about a minute. I kept trying to roll up only to get sucked back in. Stephen managed to get close enough to me at one point and was holding my boat up so only my nose and mouth were out of the water, but I couldn’t get out of the pourover. After swallowing a bunch of water and finding the water too powerful to get my paddle up to the surface in order to roll, I finally pulled-pole and swam out of my boat. HUGE mistake. I couldn’t swim out of the pourover. It kept pushing me way under and as soon as I would resurface, I would get pushed under again! Stephen came close and told me to grab his boat, but the pourover had me and I was pulling him into the pourover with me. He told me to let go and I kept getting recirculated. It was really scary, I started kicking really hard, and then Stephen grabbed me before the arms of death reached back out to snag me. He took me over to a calm spot in an undercut rock and we watched two guys in a raft spend another 20 seconds trying to get my boat out of the pourover. The managed to get the boat out, and pulled me onto the raft and took me to a safe place. It was so scary that I couldn’t help but have a huge grin on my face afterwards, simply because I was still alive! The raft-guys couldn’t believe that I held on for as long as I did and were really impressed. I was so glad that Stephen and those guys were there to rescue me. The Panther Creek Trail was just as horrible as everyone has said it was, and I really shouldn’t have hiked it because of my knee. I had to stop a bunch of times. It was really as terrible as Clay had written about last year this time. Luckily, James parked his car along the road and it saved us an extra 30 feet or so of vertical climbing. Yeah! I was so excited that (other than the slot pourover incident) my first day on the Upper Gauley went so well. I really had no reason to be so nervous.